Many claim that China will soon overtake the US. This article argues that this claim is based on a misuse of statistics. ICP price data is necessary to compare living standards, since a dollar’s worth of yuan buys more in China than a dollar buys in the US. But the fact that rice and clothes are cheap in rural China does not make the Chinese economy larger. What matters for size in the world economy is how much a yuan can buy on world markets. Using the correct prices, the US remains the world’s largest economic power by a substantial margin. Widespread recent reports have trumpeted: “China to overtake US as top economic power this year.” The claim is basically wrong. The US remains the world’s largest economic power by a substantial margin. 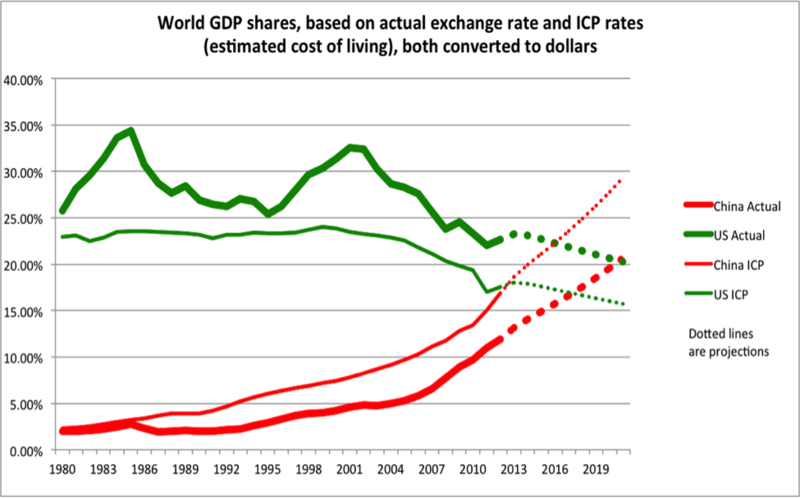 The ICP numbers compare countries’ GDPs using PPP rates, rather than actual exchange rates. This is the right thing to do if you are interested in individual living standards. It is the wrong thing to do if you are interested in measuring a country’s weight in the global economy, I would argue. When thinking about a country’s size in the world economy, it’s how much the yuan can buy on world markets that is of interest. PPP tells you how many haircuts and other local goods it can buy in China. The bottom line for China is that it has a ways to go before it surpasses the US by either criterion – income of the average Chinese (correctly measured with PPP rates), or aggregate size of the Chinese economy (GDP correctly measured at actual exchange rates). This in no respect detracts from the country’s impressive growth record, which at about 10% per annum for three decades constitutes a historical miracle (Prasad 2009). At current exchange rates, the American economy is still almost double China’s – 83% bigger to be precise. But the day is not far off. If the Chinese real growth rate continues to exceed US growth by 5% per annum and the yuan appreciates at 3% a year in real terms (inflation is higher there), then China will pass the US by 2021 – soon, but not imminent. The PPP-versus-exchange rate issue is familiar to international economists. 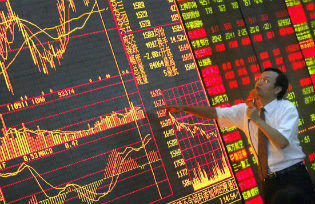 This annoying but unavoidable technical problem arises because China’s output is measured in its currency, the yuan, while US income is measured in dollars. How should you translate the numbers so that they are comparable? The obvious solution is to use the contemporaneous exchange rate (multiply China’s yuan-measured GDP by the dollar-per-yuan exchange rate, so that is expressed in dollars). Someone then points out, however, that if you want to measure the standard of living of Chinese citizens, you have to take into account that many goods and services are cheaper there. A yuan goes further if it is spent in China than if it is spent abroad. Some internationally traded goods have similar prices. T-shirts are virtually as cheap in the United States as in China, in part because we can buy them from there. (Oil is almost as cheap in China as abroad, because it can import it.) But haircuts – a service that cannot readily be traded internationally – are much cheaper in China than in the US. For this reason, if you want to compare income per capita across countries, you need to measure local purchasing power, as the ICP does. The PPP measure is useful for many purposes, like knowing which governments have been successful at raising their citizens’ standard of living. A second application is estimating whether the country’s currency is ‘undervalued’, controlling for its productivity (Cheung 2012, Cheung et al. 2010, Subramanian 2010). A third is judging whether it is reasonable to expect that they have the means to start cutting pollution. The turning point for sulphur dioxide in international data has been estimated at roughly $10,000 per capita in today’s dollars (Frankel and Rose 2005). China is now there. Looking at income per capita, China is still a relatively poor country, even by the PPP measure and even though it has come very far in a short time (Pethokoukis 2014). Its income per capita is now about the same as Albania’s, in the middle of the distribution of 199 countries (99th). But Albania doesn’t often get headlines. Why are we so much more interested in China? Partly because it is such a dynamic economy, but not just that. China has the world’s largest population. When you multiply a medium income per capita by a billion ‘capita’, you get a large number. The combination of a very large population and a medium income gives it economic power, and also political power. Why do we consider the United States the incumbent number 1 power? Partly because it is rich, but not just that. If income per capita were the criterion, then Monaco, Qatar, Luxembourg, Brunei, Liechtenstein, Kuwait, Norway, and Singapore would all rank ahead of the US. For the purposes of that comparison, it does not much matter whether you use actual exchange rates to make the comparison or PPP rates. Relative rankings for income per capita don’t depend on this technical choice as much as rankings of size do. The reason is that the PPP rates are highly correlated with income per capita, the phenomenon known as the Balassa-Samuelson relationship (Balassa 1964, Samuelson 1964). If you are choosing which country to be a citizen of, you might want to consider one of these richest countries. But we don’t consider Monaco, Brunei and Liechtenstein to be among the world’s ‘leading economic powers’, because they are so small. What makes the US the number one economic power is the combination of having one of the highest populations together with having one of the higher levels of income per capita (The Economist 2014). So there is a widespread fascination with the question how China’s economic size or power compares to America’s, and especially whether the challenger has now displaced the reigning champ as number one (Subramanian 2011a). It seems to me that PPP rates are not the best ones for making this comparison. Why? • From the viewpoint of multinational corporations, how big is the Chinese market? • From the viewpoint of the IMF and other multilateral agencies, how much money can China contribute and how much voting power should it get in return (Frankel 2014)? • From the viewpoint of countries with rival claims in the South China Sea, how many ships can its military buy? For these questions, and most others where the issue is total economic heft, you want to use GDP evaluated at current exchange rates. It is sometimes objected that using the current exchange rate subjects the comparison to the substantial fluctuations that exchange rates often exhibit. This is true. But the large measurement errors in the PPP adjustment are considerably worse. There is a good case for using a five-year average of the exchange rate instead of the exchange rate in one particular year. It doesn’t make much difference for the US–China comparison during this period. But even when exchange-rate fluctuations seem large, the difference is relatively small compared to the other statistical issues at stake here. Authors’ note: A shorter op-ed version of this article appeared at Project Syndicate. Comments can be posted there. Balassa, Bela (1964), “The Purchasing-Power Parity Doctrine: A Reappraisal”, Journal of Political Economy, 72(6): 584–596. Cheung, Yin-Wong (2012), “Exchange rate misalignment: The case of the Chinese Renminbi”, CESifo Working Paper: Monetary Policy and International Finance 3797. Cheung, Yin-Wong Cheung, Menzie D Chinn, and Eiji Fujii (2010), “Measuring Misalignment: Latest Estimates for the Chinese Yuan”, in Simon Evenett (ed. ), The US-Sino Currency Dispute: New Insights from Economics, Politics and Law, VoxEU, April. The Economist (2014), “Measuring GDP: The dragon takes wing”, 3 May. Frankel, Jeffrey (2006), “On the Yuan: The Choice between Adjustment under a Fixed Exchange Rate and Adjustment under a Flexible Rate”, CESifo Economic Studies, 52(2): 246–275. Frankel, Jeffrey (2010), “On the Yuan: The Choice between Adjustment under a Fixed Exchange Rate and Adjustment under a Flexible Rate”, in Simon Evenett (ed. ), The US-Sino Currency Dispute: New Insights from Economics, Politics and Law, VoxEU, April: 51–60. Frankel, Jeffrey (2012), “Internationalization of the RMB and Historical Precedents”, Journal of Economic Integration, 27: 329–365. Frankel, Jeffrey (2014), “IMF reform and isolationism in the US Congress”, East Asia Forum, 29 January. Frankel, Jeffrey and Rose, Andrew (2005), “Is Trade Good or Bad for the Environment? Sorting Out the Causality”, Review of Economics and Statistics, 87(1). Pethokoukis, James (2014), “Sorry, China, the US is still the world’s leading economic power”, AEIdeas, 30 April. Prasad, Eswar S (2009), “Is the Chinese growth miracle built to last?”, China Economic Review, 20(1): 103–123. Samuelson, Paul A (1964), “Theoretical Notes on Trade Problems”, Review of Economics and Statistics, 46(2): 145–154. Subramanian, Arvind (2010), “New PPP-Based Estimates of Renminbi Undervaluation and Policy Implications”, Peterson Institute for International Economics Policy Brief 10-8. Subramanian, Arvind (2011a), Eclipse: Living in the Shadow of China’s Economic Dominance, Peterson Institute for International Economics. Subramanian, Arvind (2011b), “Renminbi Rules: The Conditional Imminence of the Reserve Currency Transition”, Peterson Institute for International Economics Working Paper 11-14. World Bank (2014), “2011 International Comparison Program Summary Results Release Compares the Real Size of the World Economies”, Press release, 29 April. Jeffrey Frankel is Harpel Professor at Harvard University’s Kennedy School of Government. He directs the program in International Finance and Macroeconomics at the National Bureau of Economic Research, where he is also on the Business Cycle Dating Committee, which officially declares U.S. recessions. Professor Frankel served at the Council of Economic Advisers in 1983-84 and 1996-99; he was appointed by Bill Clinton as CEA Member with responsibility for macroeconomics, international economics, and the environment. Before moving east, he had been professor of economics at the University of California, Berkeley, having joined the faculty in 1979. He is an external member of the Monetary Policy Committee of Mauritius and serves on advisory panels for the Federal Reserve Bank of New York, the Bureau of Economic Analysis, and the Peterson Institute for International Economics. In the past he has visited the IIE, the IMF, and the Federal Reserve Board. His research interests include currencies, crises, commodities, international finance, monetary and fiscal policy, trade, and global environmental issues. He was born in San Francisco, graduated from Swarthmore College, and received his Economics PhD from MIT.